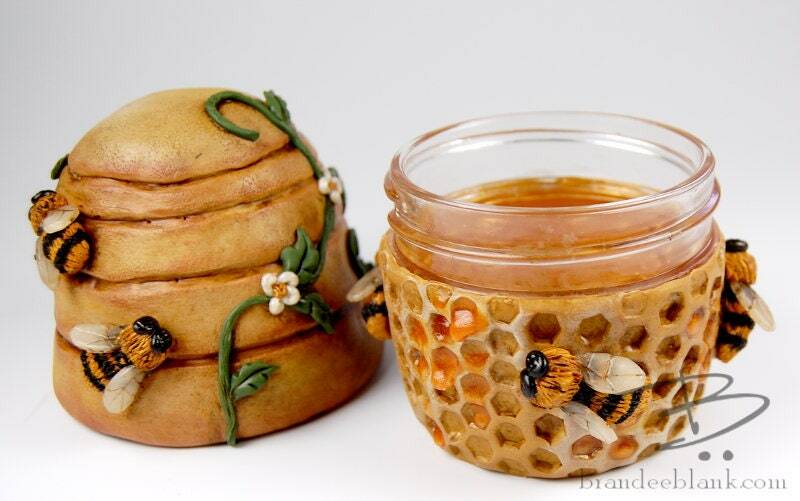 Honey Bees Stash Jar - ready to ship - air tight, water proof - 4 oz. Keep your herb fresh or keepsakes safe in this one-of-a-kind jar! My stash jars are individually made by sculpting polymer clay over 4oz jelly jars that have been tested to ensure that the lid has a quality seal. This jar is air and water tight! Most of my jars are also light-tight (or close to) - the perfect environment for keeping your stash fresh. 100% handmade! Typically, each jar goes into the oven no less than 4 times as different elements are sculpted and then baked on. The final steps include adding colorful alcohol inks, pigment powders, and paints to bring out the beauty of each piece before it is finished with an acrylic glaze. Clean with a damp cloth only! 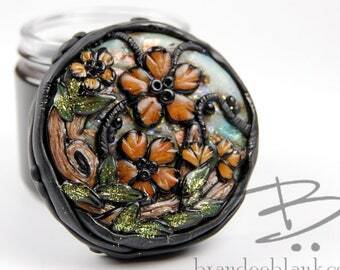 These are hand made, and while polymer clay is quite durable, handling with care will avoid dings to the finish. Keep out of prolonged, direct sunlight. ~ JAR DIMENSIONS~ About 5 inches high and about 3 inches diameter. 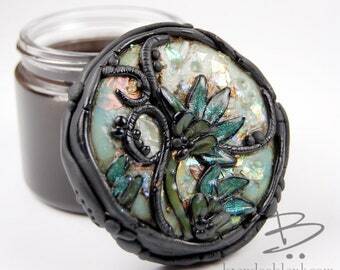 ~COMMISSIONS~ I also make these stash jars as made-to-order. 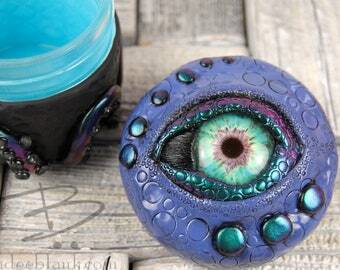 Should you want a custom piece, please refer to my Custom listing and indicate any color(s) you want and any special touches (for example, I can add gems, beads, sea shells, and additional polymer characters) just send me a note and we can work out the details. Production can *usually* be completed within one week of payment. Don't be shy to ask for something special! 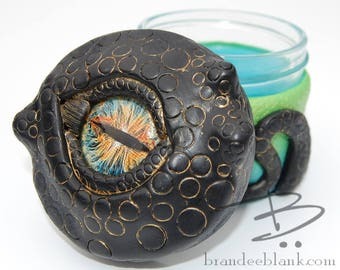 ~SHIPPING ~ I have just started using the new Etsy shipping profiles! I suggest you choose priority shipping with insurance which includes tracking and generally takes 2-4 days in the States. Your item will be packaged with care. I am environmentally respectful and try to use recycled packing materials as much as possible. My decor is intended for an adult to use as a fun and decorative object. PLEASE NOTE that although I try to include photos in varying light sources and backgrounds, due to variations in computer monitors, the colors as you view them at home may vary slightly from the images above. When you buy my items you agree to have read and understood my terms & policies. Faux Succulents Stash Jar #17E - ready to ship - air tight, water proof - 4 oz. Faux Succulents Stash Jar #17F - ready to ship - air tight, water proof - 4 oz. Grungy Chrome Purple and Black Stash Jar - ready to ship - air tight, water proof - 4 oz. 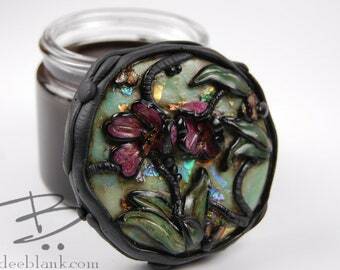 Snail on floral base Stash Jar - ready to ship - air tight, water proof - 4 oz. Fuzzy Red Monster Stash Jar - ready to ship - air tight, water proof - 4 oz. 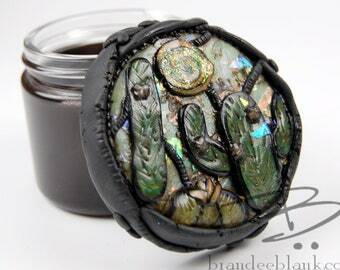 Black Octopus on Green and Blue Stash Jar - ready to ship - air tight, water proof - 4 oz. It’s absolutely stunning, and extremely detailed! Love it!! Orange Octopus on Blue Coral Stash Jar - ready to ship - air tight, water proof - 4 oz. Woodland Floral Stash Jar Green Ombre- ready to ship - air tight, water proof - 4 oz. Great necklace, I get complements on it every time I wear it. Truly unique, versatile statement piece. Thank you! Mushroom & Poppies Stash Jar - ready to ship - air tight, water proof - 4 oz. I prefer PayPal for payment. If you wish to pay by check, I will send your piece as soon as your check clears, which can take 5 business days. Payment (or notification that you have sent your check/ money order) must be made within 3 days of purchase. Please contact me if you do not think you will be able to meet this deadline. I will cancel the transaction and re-list your item if this payment schedule is not met. I want to make sure you are happy with your purchase! If you find the item is faulty in some way, please contact me within 3 days of receiving the item - and BEFORE you ship the item back. If the error was mine, I will refund your money, or offer an exchange. I do not refund if you 'change your mind', but I am happy to do an exchange. Once I receive your unwanted purchase, in new condition, I will send your choice of same-priced replacement item. In this case, the buyer is responsible for all shipping charges. I take care to securely package your purchase. I am also environmentally conscious, and strive to use re-purposed or recycled shipping materials when I am able. Orders are shipped within 3 days of receipt of payment for ready-made items. Shipping dates will be discussed with the buyers for custom orders. Unless you specify otherwise, I will send to your Etsy address. I prefer to use the Etsy shipping methods. Please see shipping details when making your purchase. If you wish to arrange other shipping, please convo me and I will do what I can to oblige your wishes. International orders, including Canada, will be shipped USPS First Class International Air Mail. Again, I am happy to upgrade (which may help speed up any delivery delays) at your expense. Customs duties and fees will be your responsibility. Transit time varies but can take 4-6 weeks. I personally take your order to the post office; once your shipment leaves my hands, I am no longer responsible for the item(s) purchased if they are lost or stolen. Please do keep this in mind, and consider buying shipping insurance. I am very happy to take your custom order. Since custom orders are personalized, I do not allow for cancellations, exchanges, or returns.